Inauguramos nuestra plataforma itinerante con un nuevo taller para el mes de Septiembre. 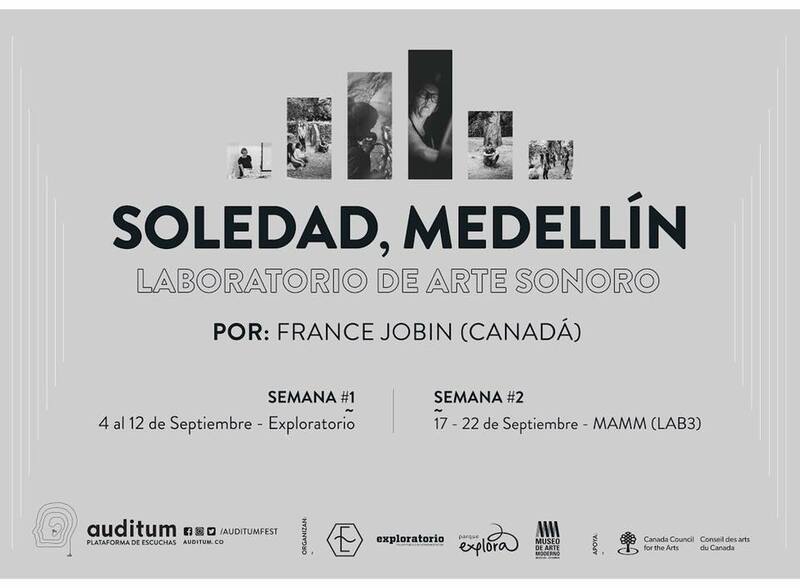 A raíz de su visita durante la Semana de la Escucha, la artista France Jobin quedó profundamente interesada por explorar más a fondo Medellín y sus sonidos, y es así como nace un laboratorio para proponer el arte sonoro, la música ambient y la escucha minimalista dentro de nuestro contexto. “Soledad, Medellín” comenzará con una primera etapa de escucha y grabación de campo en el territorio, que se desarrollará en el Exploratorio del Parque Explora; y culminará con una segunda etapa de procesamiento del paisaje sonoro y con el proceso de difusión multi-canal para una instalación a realizarse con los participantes en el LAB3 del Mamm Medellín. El laboratorio busca reconocer una multidimensionalidad de la escucha al introducirse en el entorno para sentirlo, procesarlo e imaginarlo, en su soledad, que es también esa del escucha. “Soledad” will bring the participants closer to their territory by the “act of field recording” in various parts of the city that are sonically contrasting in terms of social dynamics, geography and neighbourhoods. The multidimensionality specific to Medellin offers a rich sound palette that may enable the participants to reconnect with their environment. Throughout this process, we will share knowledge, perceptions and thoughts which I hope will inspire the participants to re-connect with their environment and ultimately, themselves. The idea of solitude is not approached from a perception of isolation but rather from a recognition of one’s connection in a world of disconnect. Technology has enabled us to be more connected yet, we have never been so apart. Social media sells this illusion of hyper connected society yet, more people are unhappy and isolated. 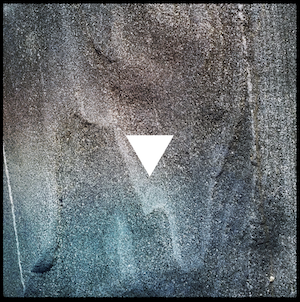 With this workshop, I-we hope to achieve a state of “Soledad”, similar to a zen state, utilizing technology, the act of listening and ambient minimal sound art in order re-connect with one, and ultimately others. “Soledad” will conclude as a multichannel sound installation created by the participants to be presented September 22nd and 23rd at MAMM -LAB3. They will be taken through the entire process of the creation of a sound installation up to and including the inauguration of their project, an opportunity for us all to experience a collective solitude through sound art. 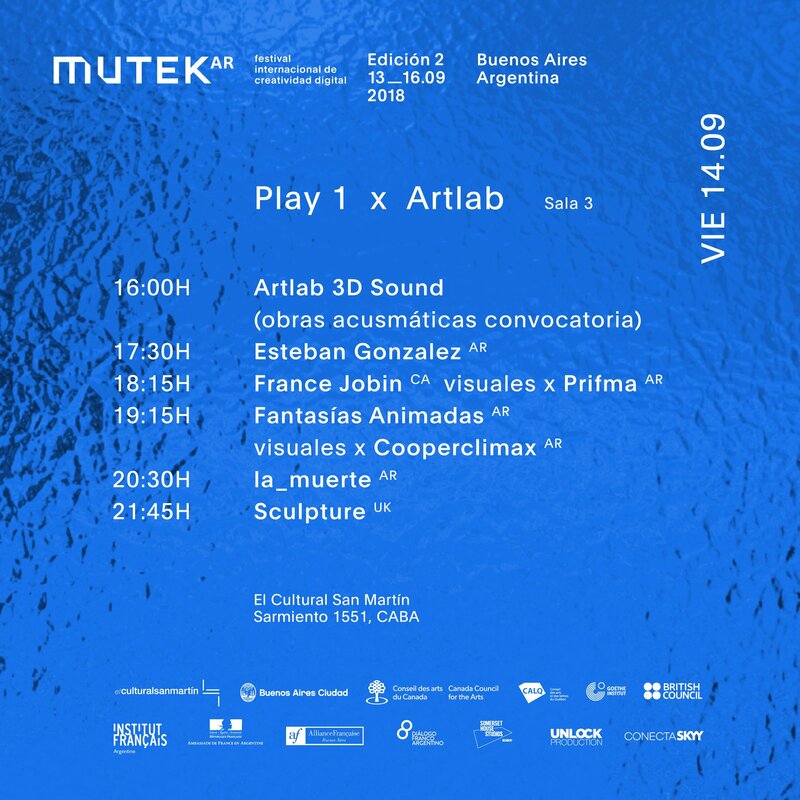 at Mutek Argentina. 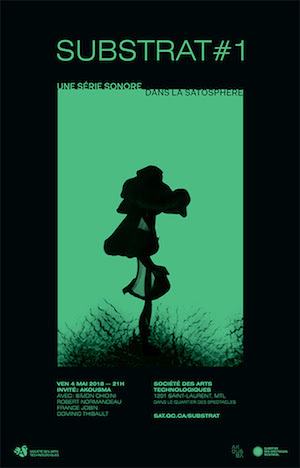 A live a/v performance with Argentinian visual artists prifma. Bonjour, I am france jobin, welcome to these are a few of my favorite things. As mentioned in earlier installments, my interpretation of field recording based works is very broad. however, the thread I like to follow is to find artists who have mastered their unique identity through the music of sound. In the last 4 years, I have spent a lot of time in the Abruzzo region of Italy. With this edition of my favorite things, it is my pleasure to showcase the sound artists of this region. France Jobin will be travelling to Medellin, Colombia in July and September 2018, to take part in an international residency organized by Éter Lab and Museo de Arte Moderno Medellin.. 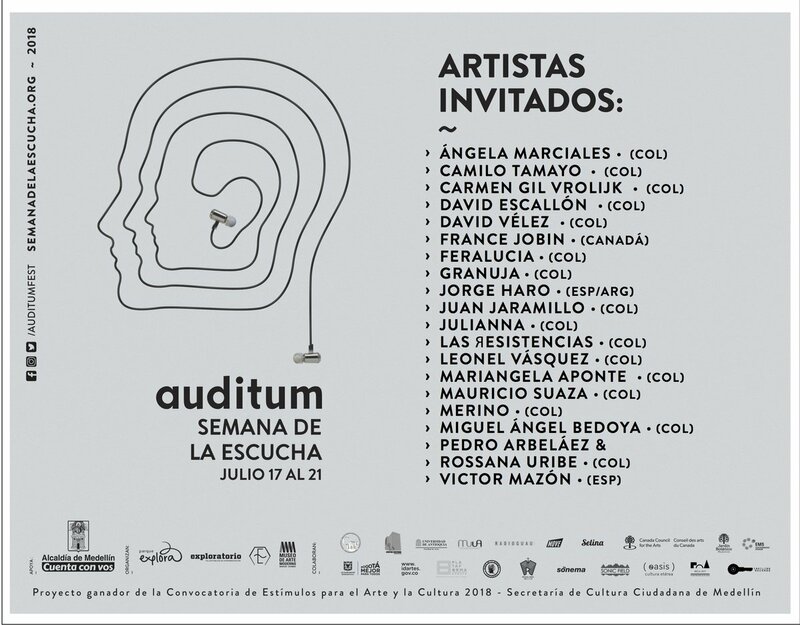 The first half of the residency will take place July 12th -26th 2018 during Auditum Festival – Semana de la Escucha. July 18th 2018 – 10 a.m. to 1 p.m.
Escuchando desde adentro – La arquitectura del sonido y nuestras expectativas. 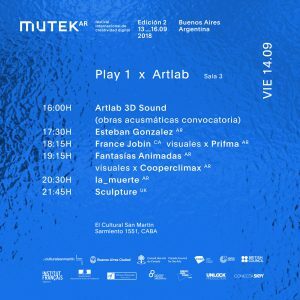 La instalación, la música y elementos visuales inspirados por la arquitectura y el manejo del espacio, convergen en el trabajo de France Jobin, artista sonora, compositora y curadora de Canadá. Es reconocida por sus “esculturas sonoras” en tiempo real que revelan una aproximación minimalista a paisajes sonoros complejos, mezclando influencias digitales y analógicas. 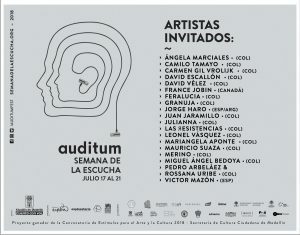 En este taller, la artista introducirá su práctica, específicamente los aspectos alusivos al sonido y los espacios; las relaciones de estos sonidos con la música tradicional, el cine y otras características de la experiencia de la percepción sonora en su sentido abierto a las diferentes formas de la escucha. “La sinestesia que se produce en los espacios arquitectónicos es la la fuerza que me impulsa a explorar el sonido. Mientras un arquitecto hace diseños pensados para ocupar un espacio, yo me intereso por elaborar esculturas de sonido que encajan en la fluidez del tiempo y la percepción. El entorno, por ejemplo, le da forma y un carácter arquitectónico a mis piezas y a su sonoridad. Por otro lado, cuando hago instalaciones y conciertos tiendo a ubicar parlantes en lugares específicos que tienen correlación con la arquitectura del espacio. De esta manera logro esculturas sonoras que no son necesariamente objetuales”. She will also present Inter/sperse* at Domo del Planetario as part of the program Micro-estruendos en el domo. Un vuelo por el espacio fulldome, microsonido y ambient en el Domo del Planetario, hoy espacio de tradición en nuestra celebración anual. Concierto de cierre de la Semana de la Escucha 2018, una exploración abierta de la escucha en la inmersión y la quietud. Esta propuesta para el formato fulldome parte como un vuelo por el espacio, por la representación en diferentes culturas de constelaciones como dioses y seres híbridos que a su vez se unen con los humanos y crean otros seres, que se aparean con bestias y crean otras bestias, que a su vez arrasan con su entorno. ¿Qué pasa con el híbrido que se cruza con otro híbrido? Merino · Ambient DJ Set · Acostumbra un techno hipnótico, un ritmo telúrico que ha sabido ubicarse en la pista de baile pero esta vez se ubica en una postura acusmática, explorando el ambient desde el arte de la mezcla y la escucha atenta de un espacio normalmente ocupado por el beat. France Jobin · Inter/sperse · Concierto nacido como adaptación de la instalación creada por la artista para sitio específico en el territorio y alrededores del Museolaboratorio (Città Sant’Angelo, Pescara) en Italia, con el apoyo del programa de residencias LUX, Museolaboratorio, 901 editions y el Conseil des Arts du Canada. A very special thanks to Miguel Isaza! 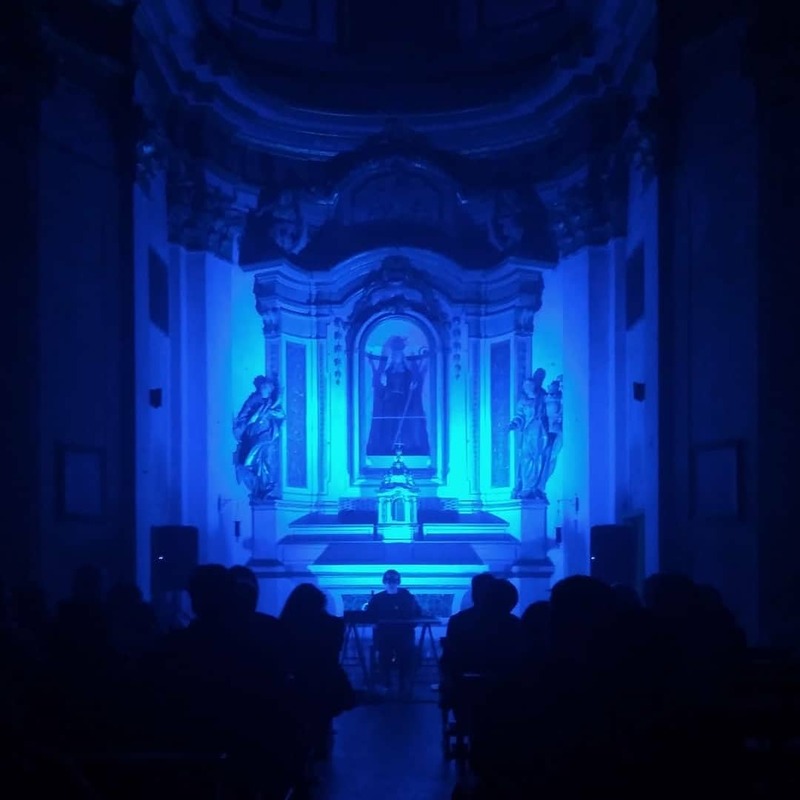 *Inter/sperse is a concert adapted from an in-situ sound installation that addressed the territory and surroundings of Museolaboratorio (Città Sant’Angelo, Pescara) which was supported by the LUX residency program, Museolaboratorio, 901 editions, Conseil des Arts du Canada. 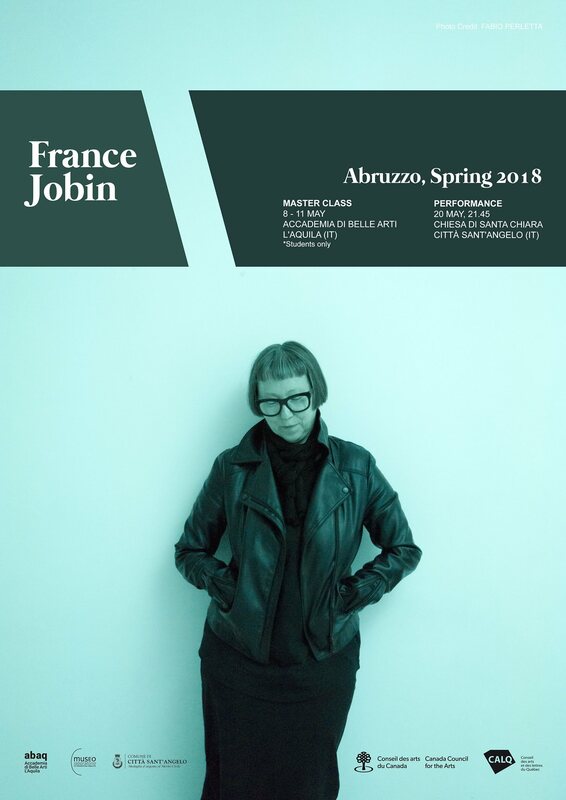 After her Master Class at ABAQ in L’Aquila, France Jobin comes back in Città Sant’Angelo to close her annual artistic stay in Abruzzo with an elegant and minimalist music performance in the beautiful church of Santa Chiara. This is made possible by the generous support of the Conseil des arts et des lettres du Québec and the Conseil des arts et des lettres du Québec. Back for a second season, Substrat invites you to dive again into the creative worlds of Montreal-based sound artists ! Through a series of performances in the Satosphere’s 157-speaker dome, Substrat offers an exclusive listening experience, between sound spatialization, experimental, electroacoustic and acousmatic music. 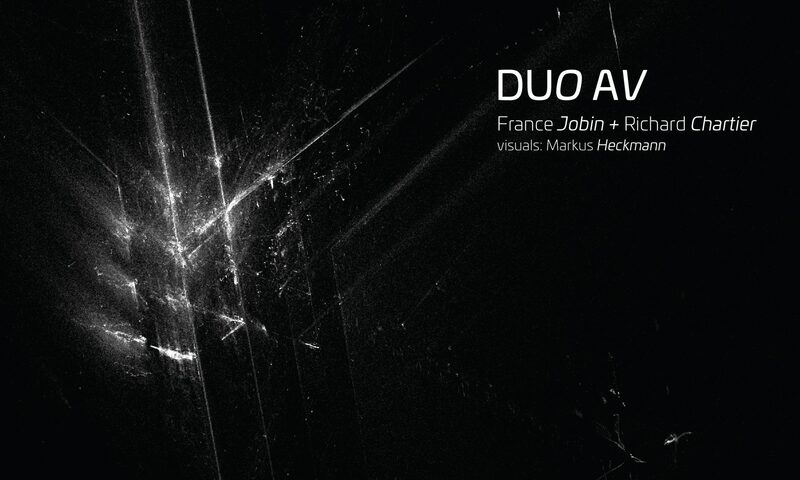 Venu à la musique par la percussion, l’électroacousticien Simon Chioini compose une musique qui fait écho aux pionniers du genre autant qu’aux courants contemporains d’une musique électronique underground. “Sans titre 3 et 4” (2018) présentent des sonorités dont la pureté contraste avec un foisonnement bruité. Artiste audio qui se distingue par une approche minimaliste d’environnements sonores complexes à l’intersection de l’analogue et du numérique, France Jobin fait entendre de véritables sculptures sonores. Sa pièce “24-45” (2018) mêle hauteurs et amplitudes dans un ballet visant à déstabiliser la perception de l’auditeur. L’un des fondateurs d’AKOUSMA, Robert Normandeau consacre la majeure partie de son travail à la musique acousmatique, de même qu’à l’enseignement (Université de Montréal). Sa pièce La part des anges (2011-12) est construite à partir d’échantillonnages de chants a capella. Subharmonic: A Sonic Arts Symposium spans two immersive days of interactive workshops, thought-provoking panels, and live performances for artists and audiences of all experience levels to explore, discuss, and engage with a broad range of contemporary and experimental sound art and its influences. Programs will touch on electronic and noise music, video and light installation, film and video, space and architecture, racial and gender equity in the field, and more. 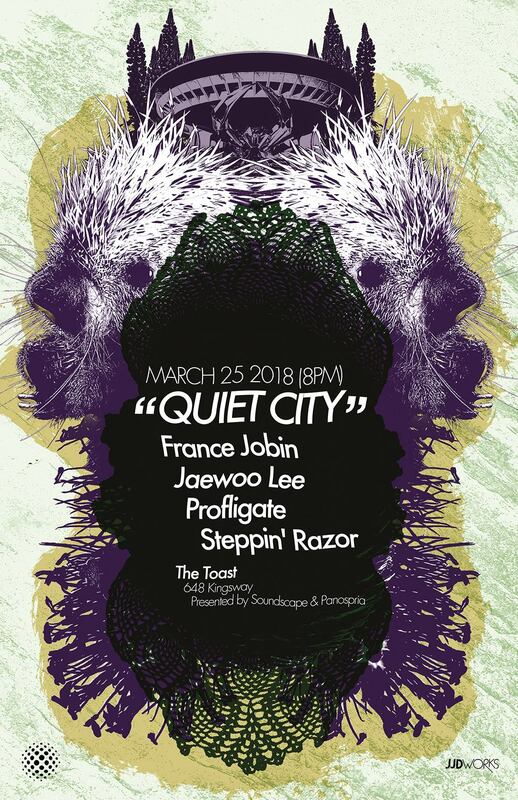 Both local and global critical ideas and creative practices will be shared, with a keynote presentation by sound art curator and practitioner France Jobin (Montréal) and performances and conversations featuring numerous local artists. Collaboratively curated by a consortium of local arts organizations and collectives, the full scope of symposium activity reflects a commitment to amplifying underrepresented voices in sound art and highlighting the depth and diversity of sonic art landscape, practices, and communities in Portland and beyond. 11:00 AM – 12:30 PM – Field recording workshops facilitated by Burke Jam, France Jobin, and Chloe Alexandra. This workshop will involve groups of 15-20 participants, organized into a recording walk. Each group will explore sounds found within walking radius of PICA. Exploring natural, industrial, and climatological, acoustic ecologies, the workshop will focus on basic recording techniques, ways of listening, DIY tools and unconventional recording technologies. RSVP REQUIRED – USE THIS FORM TO SAVE YOUR SPOT. 11:30 AM – 12:30 PM – SIX Installation / Interactive Demo 15 minute demonstration of several sound-making objects which are amplified with contact mics, and mixed into the six-channel setup followed by a Q+A with Marcus Fischer and hands-on sound-making and panning to provide an experience that connects the soundmaking with the multi-channel possibilities. In this hour long interactive workshop we will explore using voice in conjunction with modular synthesizers. We will cover some basic concepts and a simple signal flow we can use to patch our voice to a eurorack modular synth. Everyone will be encouraged to use their voice and turn knobs! RSVP REQUIRED – USE THIS FORM TO SAVE YOUR SPOT. In this hour long interactive workshop we will explore sound collage and layering with multiple DJ set-ups. We will cover basic concepts of using CDJS and explore as a group to create soundscapes and unexpected layers & rhythms from field recordings, samples, and more. RSVP REQUIRED – USE THIS FORM TO SAVE YOUR SPOT. Artist Share and Discussion with Jamondria Harris, Shannon Funchess, Amenta Abioto, Christi Denton, Anna Vo, Myles de Bastion, and France Jobin. This panel will be ASL interpreted. 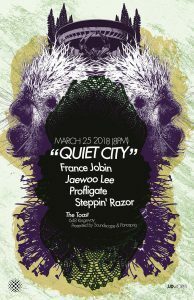 Tonight at The Toast, Quiet City proudly welcomes France Jobin from Montreal and Noah Anthony from Philadelphia with local support by Jaewoo Lee and Matty Harris. Jay Tee Geeze will be on hand to assist with cookie production and beer can distribution. Zone!